Today, the Minnesota Supreme Court issued its long-awaited opinion in a landmark state desegregation case. The decision is a major victory for the plaintiffs, civil rights advocates, and opponents of school segregation. While the lawsuit is still ongoing, the court's decision has eliminated a major legal obstacle facing the plaintiffs, and strengthened their case going forward. Although the issues before the supreme court were narrow, the court's language strongly suggests that it is willing to embrace the active elimination of segregation in Minnesota schools. Its decision may also have major implications for charter schools, and may spell trouble for another lawsuit seeking to eliminate teacher tenure in Minnesota. These developments will be discussed below. But first, some background on the case. The lawsuit, Cruz-Guzman v. State of Minnesota, was filed in late 2015 by a group of Minneapolis parents seeking statewide school desegregation. The plaintiffs argued that Minnesota schools are highly segregated, and that any segregated system of schools was "inherently inadequate," in violation of the state constitution. The plaintiffs' claim relies on the "Education Clause" of the state constitution, which instructs the state legislature to create a system of schools that is both "general and uniform" and "thorough and efficient." In a previous ruling, the state supreme court had found that this language created both a legislative duty to provide a system of adequate education, and an individualized fundamental right to an education. The Cruz-Guzman plaintiffs also made more traditional desegregation claims, arguing that schools had been intentionally segregated, violating students' constitutional right to equal protection under the law. Importantly, the lawsuit did not seek a specific remedy. Instead, it only asked that the state recognize and eliminate the constitutional violation -- i.e., that the state find a way to eliminate segregation in its schools. Although the lawsuit was filed only against the state, not any individual school or school district, a group of charter schools intervened after filing. The charter schools sought a declaratory judgement that they were not bound by the state's desegregation rules, and asserted that, as schools of choice, they by definition could not be segregated. After initial motions to dismiss, the district court allowed most of the plaintiffs' claims to advance. However, before the trial began, the state appealed, and the Minnesota Court of Appeals threw out the case. In doing so, it relied on a single, simple ground: it held that the plaintiffs' Education Clause claims were a political question more appropriate for the legislature, and therefore "nonjusticiable." In other words, the Court of Appeals said that the Education Clause's fundamental right to an adequate education was unenforceable in court, at least as it related to school segregation. Today, after a second appeal, the state supreme court reversed that decision. It decided that enforcing the Education Clause is indeed the obligation of the courts, and that Cruz-Guzman plaintiffs could proceed. Standing alone, this decision would constitute a major victory for civil rights advocates, giving them their day in court, so that they can make the case that Minnesota school segregation is severe, worsening, and corrosive to educational opportunity. But in addition to the court's main holding, there are several noteworthy passages which should please the plaintiffs and their supporters around the country. The dissent concedes that a claim of segregated schools is justiciable, but maintains that appellants’ claims are not “traditional” segregation claims and therefore the claims are not justiciable. It is self-evident that a segregated system of public schools is not “general,” “uniform,” “thorough,” or “efficient.” Minn. Const. art. XIII, § 1. Regardless of whether the context is a “traditional” segregation claim or a different type of claim, courts are well equipped to decide whether a school system is segregated, and have made such determinations since Brown, 347 U.S. at 495. This constitutes a remarkably clear endorsement of the idea that segregated education is incompatible with the Minnesota Constitution. In particular, the holding that it is "self-evident that a segregated system of public schools is not 'general,' 'uniform,' 'thorough,' or 'efficient," has major consequences for the resolution of Cruz-Guzman. That segregated schools are inherently inadequate, and therefore violative of the Education Clause. But in this footnote, the court dismisses all talk of "adequacy." Instead, it states that it is "self-evident" that segregated school cannot satisfy the constitutional requirements. In other words, the fact that segregation violates the Minnesota Education Clause is simply presumed. As a result, it appears that plaintiffs no longer need to focus on demonstrating the negative effects of segregation; instead, they only need to focus on proving that it exists. As an aside, this statement also undermines an important argument of the charter school intervenors. The charter schools had hoped to make the case that segregation in charters schools did not result in an inferior, inadequate education. This footnote suggests that that claim is no longer available to them -- it leaves no room to assert that Minnesota schools can be constitutionally segregated. The second implication of footnote 6 is that the plaintiffs do not have to prove that segregation has been created intentionally. Although the court does not explicitly mention intent, it implies that the mere fact of existing segregation would create a system that is not general and uniform. The court sends a second signal with an evocative citation to a landmark education law case. In Rose v. Council for Better Education, the Kentucky Supreme Court held the state's entire school system unconstitutional, ruling that it did not meet the requirements of the state constitution. This was the first major state "school adequacy" lawsuit, touching off a national wave of state-level school litigation. The Kentucky court famously required sweeping changes to the state's educational system in order to conform to state constitutional requirements. It wrote"[t]he children of the poor and the children of the rich, the children who live in the poor districts and the children who live in the rich districts must be given the same opportunity and access to an adequate education." It also devised six broad evaluative factors to determine whether schools were adequate. Over time, some state courts have developed a more negative view of the Rose decision. In particular, judges have seemed concerned that Rose-like reasoning would obligate courts to conduct open-ended interventions in the education system -- a role some feel is more properly left to the legislature. We will not shy away from our proper role to provide remedies for violations of fundamental rights merely because education is a complex area. The judiciary is well equipped to assess whether constitutional requirements have been met and whether appellants’ fundamental right to an adequate education has been violated. See, e.g., Rose v. Council for Better Educ., Inc., 790 S.W.2d 186, 212–13 (Ky. 1989); Pauley, 255 S.E.2d at 877–78. Although the Legislature plays a crucial role in education, it is ultimately the judiciary’s responsibility to determine what our constitution requires and whether the Legislature has fulfilled its constitutional duty. Not only does the Minnesota court embrace Rose's conclusion that the courts are ultimately responsible for delivering constitutional rights, it also suggests that it shares Rose's broad-minded approach to solutions. In particular, the opening line in the passage above is unambiguous: "We will not shy away from our proper role to provide remedies for violations of fundamental rights merely because education is a complex area." This is not the language of a court that is preparing to take a laissez-faire, soft-touch approach to an ongoing constitutional violation. Instead, it is the language of a court that seems prepared to intervene vigorously to vindicate the rights of Minnesota schoolchildren. The complaint contains copious data demonstrating a “high degree of segregation based on race and socioeconomic status” in Minneapolis and Saint Paul public schools. The public schools in Minneapolis and Saint Paul that appellants’ children and other school-age children attend are “disproportionately comprised of students of color and students living in poverty, as compared with a number of neighboring and surrounding schools and districts.” These segregated and “hyper-segregated” schools have significantly worse academic outcomes in comparison with neighboring schools and suburban school districts in measures such as graduation rates; pass rates for state-mandated Basic Standards Tests; and proficiency rates in math, science, and reading. Appellants describe these racially and socioeconomically segregated schools as “separate and unequal” from “neighboring and surrounding whiter and more affluent suburban schools” and detail the extensive harms of racial and socioeconomic segregation. This passage is not dispositive, of course; no trial has been held, no experts have testified, and the defendants have not responded to these claims. But most of the plaintiffs' statistical evidence is effectively unrebuttable -- straightforward statistics on changing school populations, sourced to the state's own data. In other words, if the court finds this evidence to be compelling, the defendants have a hard road ahead if they intend to change its mind. Throughout its short life, the Cruz-Guzman lawsuit has been dogged by parallel claims in a superficially similar case, which was filed shortly afterwards. That case, Forslund v. Minnesota, mimics the famous Vergara lawsuit in California, and attacks Minnesota's teacher tenure law as unconstitutional. The Forslund case, like Cruz-Guzman, relied on the state Education Clause. It claimed that many Minnesota students were receiving an inadequate education. It then argued that, because some research shows teacher labor protections and other educational regulations are correlated with reduced academic performance, those laws had to be overturned so students' right to an adequate education could be vindicated. Because they both rely on the same constitutional provision, Forslund and Cruz-Guzman have frequently been tied together. Critics asserted that Forslund showed the dangers of allowing parents to bring Education Clause claims. If Forslund succeeded, critics claimed, any statute, rule, or policy that eroded academic performance could also be attacked as unconstitutional, reducing judges to a perfunctory policymaking role. The two cases also tracked each other through the courts. After the Forslund case was roundly defeated in district court, it was thrown out by an appellate panel, which justified its decision by citing Cruz-Guzman and the alleged nonjusticiability of the Education Clause. Ironically, despite this shared history, Forslund's plaintiffs were frequently antagonistic to the desegregation plaintiffs of Cruz-Guzman. They filed an amicus brief to the supreme court in Cruz-Guzman, but did not argue that the court should allow the desegregation case to proceed. Instead, the Forslund plaintiffs only maintained that that their own claims were distinguishable and should survive. In other words, Cruz-Guzman can continue because it only asks the court to declare that existing Minnesota segregation is unconstitutional, and does not seek any specific remedy. It identifies a violation of a fundamental right, but it does not seek to use the courts to implement a preferred package of policies. The same cannot be said of Forslund. The latter case is broad and vague about the identified violation, citing, somewhat generically, lower test scores and academic performance. But it is very precise about the remedy it seeks: a specific change to a particular law. The language of the supreme court suggests that while Cruz-Guzman's claim is justiciable, Forslund may be asking the court to engage in an inappropriate exercise of legislative power. Since nearly the very beginning of the Cruz-Guzman case, charter schools, as third-party intervenors, have asserted that they are not bound by the same desegregation rules that bind traditional Minnesota schools. They have argued that state law exempts them from most desegregation requirements, that they cannot be segregated by definition, and that any government interest in segregation must be weighed by the equally important consideration of parental choice. Today's decision makes no mention of any of these assertions. While the substance of the charter schools' claims was not before the court, the decision's use of sweeping, broad language is still suggestive -- for instance, the declaration in footnote 6 that it is "self-evident" that segregation violates the constitution. There is little to indicate that the supreme court is considering carving off a constitutional exception for charter schools, or otherwise permitting them to self-segregate in the name of parental choice or some other principle. There have been major stories recently regarding school diversity (among other things! ), including the Trump Administration’s reversal of Obama-era guidance on Affirmative Action. In the Trump era, and by design, just about every day brings a deluge of stories that are often as consequential as they are morally shocking. In that constant wave of big stories, others get lost, though these are often just as important and troubling. I want to focus on one of those overlooked topics: racial disparities in school discipline. So far this summer, there’s already been at least four important studies released about school discipline, as well as several appalling news stories -- including yet another police shooting that has not gotten nearly enough attention. There was a bit too much for one post, so I split it into two parts – this one focuses on the research and an upcoming post will look at the news stories. In Baltimore, discipline disparities are exacerbated by the fact that the city’s school district is the only one in Maryland that actually has its own police force. It’s important to note that there’s both a personal/educational cost to the individuals who are suspended (more about that below) as well as a larger social cost. The Baltimore Sun article notes that when Black girls speak up about things that bother them, they are “labeled as aggressive rather than encouraged to be activists.” And society loses out on the benefit of their activism. The study included about 70,000 NYC high school students between 2005-2011, and it compared each student to her/himself before and after suspension. The researchers concluded that the suspensions themselves made it less likely that students would pass their math and English classes and more likely that students would dropout. One caveat: after the time period of the study, NYC changed its school discipline policies to reduce suspensions. So this research can’t tell us whether those policies had a positive effect on student outcomes. I should note there have been some sources of hope here – such as a new Ohio bill aims to bar suspensions for K-3 students. For some issues in the school diversity universe, the relationship between structural racism and student outcomes can be complex, and difficult to see immediately. But racial bias in school discipline is different. Factors like unconscious personal bias and structural racism are directly observable in the numbers. Again -- in Baltimore, Black girls make up 80 percent of the female student population, yet account for 95 percent of the suspensions. All but 5 percent! Likewise, solutions to racial inequality can also be complex, but in the case of discipline disparities, it should be straightforward. 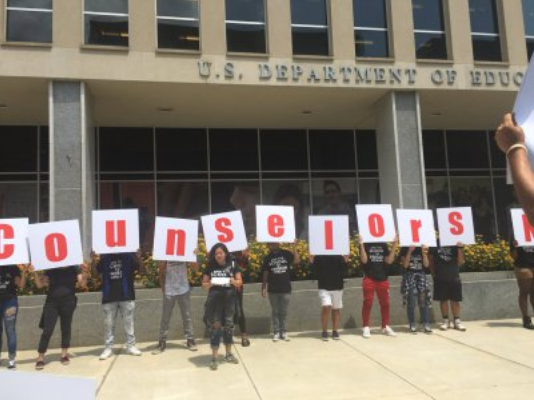 Several of the studies above recommend that instead of relying on police and/or exclusionary discipline, schools should hire more counselors and student support personnel. It’s exactly like the students say in the photo above – this is from the Alliance4EdJustice, a coalition of youth organizers who work for the liberation of youth of color. In the photo, students are standing before the federal Department of Education, holding signs that read “Counselors Not Cops” and wearing shirts that say “End the School to Prison Pipeline.” There’s an enormous social cost to ignoring/disregarding these kinds of changes. Next week, I’ll look at how that social cost is evident in several recent news stories that are, in my opinion, as morally appalling as others that attract national headlines. The city of Minneapolis is currently in the middle of its comprehensive planning process, and yesterday closed the comment period on the first draft of its plan, entitled the 2040 Plan. Those comments are available here. Improve access to exclusive, prosperous neighborhoods, ensuring that their opportunities are not only available to the white and affluent. Protect diverse neighborhoods, preserving their racial and economic integration and preventing any decline towards poverty and segregation. Revitalize segregated neighborhoods, finding ways to increase neighborhood investment, and eliminating discriminatory policies that continue to concentration of poverty in those areas. The full comments contain a discussion of several aspects of housing policy. First, they lay out the binding legal fair housing obligations that must govern Minneapolis's policy decisions. Second, they discuss the so-called "fourplex plan," and how it can potentially contribute to greater housing affordability and integration. Third, it criticizes the 2040 Plan for only discussing segregation in terms of racial exclusion and never addressing the problem of racial confinement. 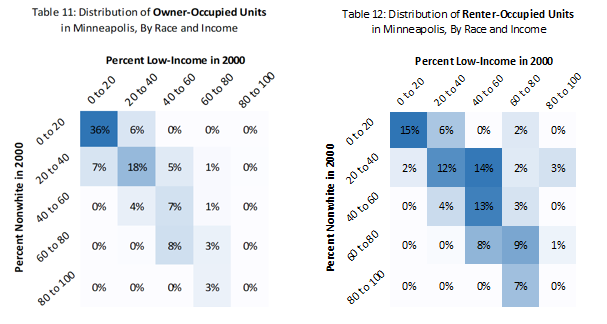 Unfortunately, Minneapolis has a long history of using housing policy and other policy mechanisms to concentrate families of color in a limited set of impoverished neighborhoods with little educational or economic opportunity. The comments also include an appendix with a set of tables demonstrating the unequal distribution of population subgroups and housing types across the city.